It is with g reat honour that the Womanity Foundation announces the release of the book relating the incredible maritime adventure of her godmother, Dona Bertarelli, who has participated in one of the most difficult and gruelling of sailing challenges: the Jules Verne Trophy. 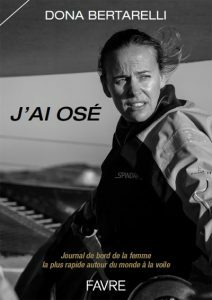 Entitled J’ai osé The log book of the fastest woman to sail around the world, the book genuinely relates her day to day life during the 147 days 10 hours 59 minutes 02 seconds that this human adventure lasted on board of the world’s largest racing trimaran, Spindrift 2. The book also takes the readers on a philanthropic journey and help them to understand how sailing and philanthropy can work together to help children learn about marine conservation and environmental change through lesson plans designed for schools in France and Switzerland. Thus, the book also features blog articles titled ‘Out of the Classroom’, part of the incredible Spindrift for Schools programme. Dona Bertarelli, who has since the beginning been involved the Womanity Foundation has decided to donate all her royalties from the book to the Foundation, of which she is a patron.